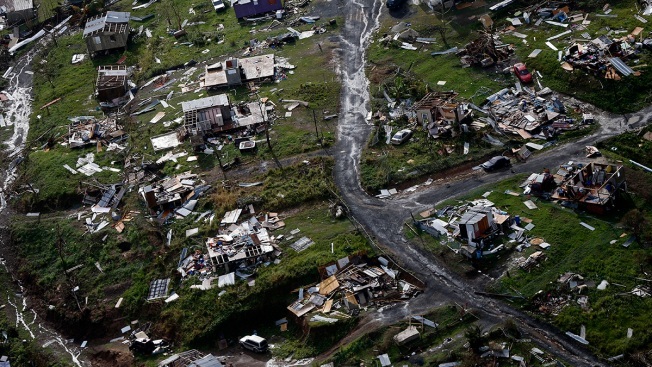 FILE - In this Sept. 28, 2017, file photo, debris scatters a destroyed community in the aftermath of Hurricane Maria in Toa Alta, Puerto Rico. Dozens of Puerto Rican families displaced by Hurricane Maria suddenly had their temporary housing assistance cut last week just days after being given an extension, NBC News reports. The families had been staying in hotels in Connecticut and receiving short-term housing assistance following the deadly storm. The state requested from FEMA a two-week extension for about 45 displaced families on Jan. 11, and Connecticut officials were told by FEMA that the extension was granted through Feb. 14. But on Jan. 17, FEMA allegedly changed the status of those families in their database to terminate their hotel stays beginning the following day, according to the governor’s office.